Helios appears in human form and explains Queen Nehellenia's plan to destroy the Earth, while Minako is upset that she is the only Sailor Senshi who cannot transform. Sailor Moon, Sailor Chibi Moon, and Sailor Jupiter discover Mamoru coughing up black blood and are immediately worried about him. Chibi Moon asks Pegasus if he knows anything about what is going on. He says that it appears to be time to talk, and changes into his human form. He introduces himself as Helios, a priest of Elysion, which is a sacred place deep in the heart of Earth. Elysion, the planet, Helios, and Prince Endymion are all connected in spirit, and the curse on him and Elysion is now affecting Mamoru. He explains that the queen of the new moon, Queen Nehellenia, placed a curse upon Elysion in order to destroy the Earth's defenses from within as they attack from without. If their efforts continue, the Earth will be covered in darkness and nightmares. He asks Sailor Moon to use the power of the Silver Crystal to defeat them. He believes she is the chosen maiden, the princess Senshi, who has the power to break the seal on the Golden Crystal. 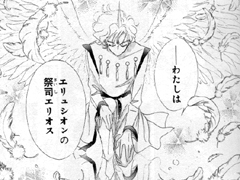 As he speaks he reverts to his Pegasus form and disappears. Mamoru doubles over in pain again and Usagi rushes to him, but he tells her she shouldn't stay with him because she might be affected by the curse as well. She refuses to leave, saying that she will stay with him forever and protect him. The Inner Senshi gather together to talk about what Helios said. They wish the Outer Senshi were still around, because thoughts of them had helped them find their new powers. Minako agrees, but afterwards is secretly worried about how she still cannot transform herself. Minako talks to Artemis about her concerns, and he tells her that she shouldn't be worried, he's sure that she will soon be able to transform as well. Minako doesn't seem reassured, and goes to take a bath; Artemis peeks in and leaves quickly, red-faced. Diana observes that Artemis looks at Minako with a lover's eyes, and Luna bites his tail. The Amazoness Quartet watch Minako in their mirrors, observing that she can't transform, and decide to have some fun with her. They summon Xenotime and Zeolite, who promise to obtain the Silver Crystal. As the girls return to the circus they observe how dirty the city has become, and how irritable people are getting in the unusually hot weather. Rei carries Michiru's mirror to help her find the source of the strange events, which leads to a conversation about the absent Outer Senshi. Minako is hurt, thinking that the others want to depend on the Outer Senshi instead of her, their leader, and decides that she must be a bad leader. She runs away, crying, and is approached by a man who invites her to an idol audition. The card for the scout says that he works for "Dead Moon Entertainment," and even though she realizes it is a trap, Minako goes anyway. She tells Artemis that she thinks it is her chance to show her power. When Minako arrives at the audition she is dismayed by how many girls are there. She wonders if she should call the others for help, but is determined to get by on her own. It turns out the talent contest is a "survival audition" where the contestants must get through a jungle to rescue children held on the top of a tower. As Minako rushes to the tower, Sailor Jupiter, Sailor Mars, and Sailor Mercury show up to help her. Dismayed by the fact that she still can't transform, Minako rushes off into the jungle on her own. Minako makes it to the top of the tower by herself only to find that the children were really Lemures. She is overwhelmed by them and falls under VesVes's power, but Artemis scratches her and makes her return to her senses. A trapdoor suddenly opens beneath her and she falls, but Artemis just barely manages to grab her. As he is clinging to her, PallaPalla appears and makes a boulder fall upon him, and Minako cries out his name too late to warn him. This page was last edited on 29 June 2015, at 22:02.